Solar is the new cool. While scientists are pushing their frontiers to increase energy conversion outcomes and look for sustainable solutions to Earth's impending energy crisis by look skyward, Union Minister for Science, Technology, Earth Science, Environment, Forests and Climate Change, Dr Harsh Vardhan also looked skyward to the sun, but with his trademark hat doff to India's glorious past, "Surya Bhagwan had always been there. He is showing his blessing and we should utilise it the right way," he said to a room full of researchers, scientists and industry leaders from the solar energy spectrum, gathered at IIT Madras. The Minister, whose comments on how ancient Indians had invented the Pythagoras Theorem before the Greeks took undue credit and that we had a handle on Algebra before the Arabs got there have met with a lot of trolling online, appears unfettered by all of it. His support of a paper presented at a previous Indian Science Congress where the author said that ancient Indian sages had planes that were 60x60 feet and had an array of tiny engines, also came in for a lot of criticism. 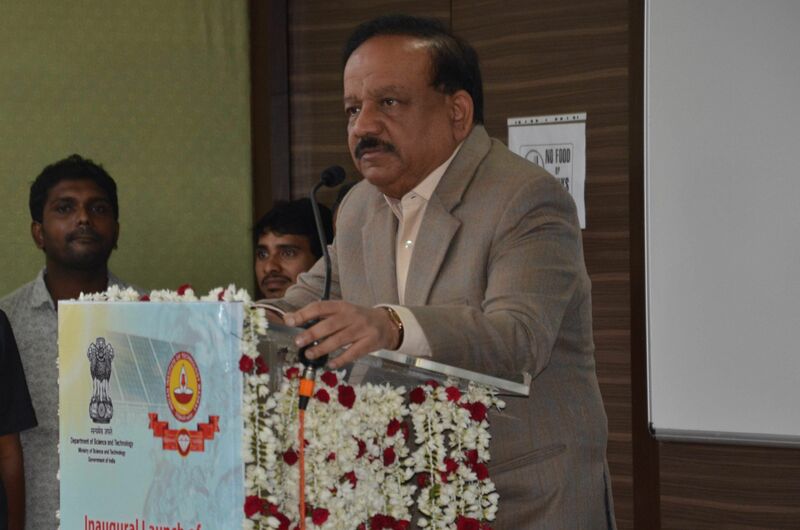 Harsh Vardhan was unveiling three cutting-edge research centres helmed by the Department of Science of Technology. The DST – IITM Solar Energy Harnessing Centre, coordinated by Prof MS Ramachandra Rao with a team of 29 faculty members from IITM and 6 collaborating institutions, was set up as a result of successful completion of several competitive grants to the tune of Rs. 16 Crore from the DST to carry out various solar energy research and development projects under the Solar Energy Research Initiative of DST. The impactful, fundamental and applied research carried out over the last four years has resulted in networking of various departments of IIT Madras, academic institutions and solar industry. This has culminated in the establishment of DST- IITM Solar Harnessing Centre with additional Central Government funding support of about Rs 39 crore. The network of researchers engaged in the centre comprises of scientists from IIT Madras, IIT-Guwahati, Anna University, and BHEL, which is further expanding. The Union Minister also lavished praise on the Prime Minister and his dint for scientific spirit and temper, "Our Prime Minister has unusual capabilities of taking India back to its glorious past and he is always reminding us of our scientific social responsibility," he explained.